Previous PostTools!Next PostGuess the cable length to win stickers! Do you still have this Multimeter spare parts? I’m looking for this 8840A model display, mine got broken. If you still have it please contact me on my e-mail, and we will negotiate it. reading this old post. I changed my VFD by LED by just changing the TTL VFD Display Drivers ( 90 Volt) to LED Drivers. Works seamless. Can you let me know what you did in the repair and what parts were required? 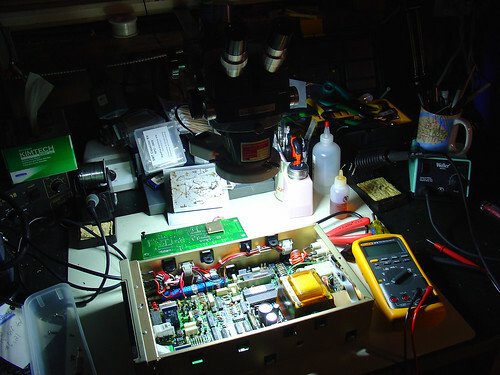 When I got it, this Fluke 8840A (a nice but old benchtop digital multimeter) was failing two self tests and giving me some goofy resistance readings (like 2x the actual resistance in some ranges). I opened it up and started poking around (with the assistance of the service manual). Shortly after that photo was taken, one of the proprietary Fluke analog switch ICs inside decided to get really hot and short the -5 and +7.25V rails together. Since I can’t get replacement parts, I think this one is going on the shelf to serve as a source of parts for the Fluke 8842A I have that IS working. I’m looking for the AC RMS board for my Fluke 8840A. Is it possible you have one you’d part with for a reasonable price? I do have a spare true-RMS board (Option-09) for the 8840A. I’ll e-mail you directly about it.